The 7th edition of the International Law School Mediation Tournament (ILSMT), 2018, was organised by the National Law Institute University (NLIU) with the support of the International Academy of Dispute Resolution (INADR). 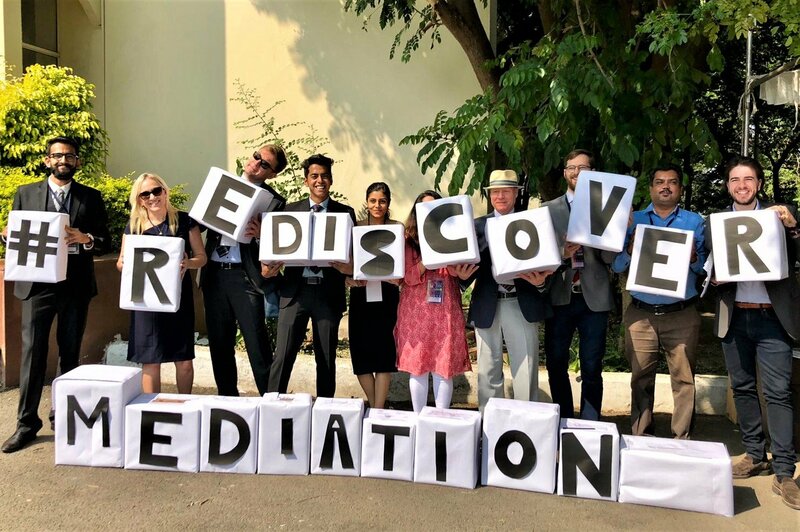 Eager participants and professional judges from across the globe gathered in Bhopal to kick-start this endeavour and take mediation to a whole new level. The judges were welcomed with a trip to the Bhimbetka caves, symbolising India’s rich heritage. The participants were then ushered in with relevant preparatory materials and a guide to the tournament. The judges and participants were able to get a taste of the exquisite Bhopal cuisine and sample scrumptious treats from the best local Bhopal eateries. The Vice Chancellor of NLIU inaugurated the tournament along with the Honourable Justice G. Raghuram, the current Director of the National Judicial Academy of Bhopal; Mr. Case Ellis, INADR representative; and Professor Sanjay Yadav, the faculty in charge of ADRC. The special guest, the Honourable Justice G. Raghuram, shared words of wisdom to aspiring lawyers by stressing the importance of the incessant search for knowledge over the superficial need to be eloquent. The 23 November 2018, marked Day One of NLIU-ILSM, where NLIU organised three training sessions which provided the participants with a platform to engage with professional mediators. The first session was conducted by US mediator, Case Ellis, who laid down the groundwork for young mediators and highlighted the intricacies and subtleties of mediation techniques. He, accompanied by Meghan Sweeney, conducted a mock enactment of client-counsel meetings wherein the participants got a chance to experience the practical aspect of mediation. The training sessions taught the students to identify the strengths and weaknesses of any given situation and use it to their advantage to reach an amicable solution. The judges paid special attention to teaching the participants how to adopt appropriate body language to create an environment which encourages fruitful negotiations. Over the span of the next two days, the participants will employ these tips and tricks to mediate their way to a solution in their simulations. The participants will go through three preliminary rounds where they will be judged by the best in this field in order to qualify for the semi-finals and finals. The winners have exciting prizes in store, ranging from internship opportunities, discounts on courses offered by some of the most prestigious arbitration, mediation and negotiation organisations, and books written by bestselling mediation professionals. NLIU and INADR came together to provide a unique opportunity for aspiring young mediators and experts to rediscover mediation. The team consists of ADRC members, Anoushka and Sana Sarosh who are both second year B.A.L.L.B. (Hons.) students of NLIU. They were assisted by Ishita Singh, a first year B.A.L.L.B. (Hons.) student of NLIU.